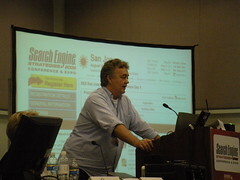 SES SJ: Beyond Googling: Where will Customers be Searching in 5 years? Beyond Google. Where will customers be searching in 5 years? Dixon Jones of Receptional asks the audience: Who doubts life after Google? About half the audience raises their hand. According to Dixon, there will be life after Google and we are already there. He cites Facebook as an example of a site that is growing links more quickly than Google. He then goes on to discuss the Trust/Convenience Contract. This contract is illustrated when searchers trust Google to give them data, as opposed to going around knocking on neighbor’s doors to find the answer. However, Google isn’t the only choice anymore. Users can and do go to blogs, Facebook, Twitter to retrieve information often removing Google from the equation. What this means for companies is that topping the search engines will soon not be enough. Rather, marketing across channels will become increasingly important. As more people use Google less, it will be up to savvy online marketers to identify where their audience is consuming information and to become a member (note – I said member not marketer) of that same destination. In summary, we are already in ‘Life after Google’. We are changing who we trust and posing questions back to the community we have developed, as opposed to relying on dominant media sites/search engines. The New Socialism is next with Frank Watson from Kangamurra Media. Twitter allows you to search real-time about natural disasters, serious local alerts, find immediate responses or advice, niche information and online customer service. At the end of the day, Twitter is super convenient. Next Anne Kennedy, from Beyond Ink, steps up to talk about Video. Online video advertising, from eMarketer.com, is expected to steadily increase year over year. A drop in the bucket compared to TV, but speaks to human nature and our interest in the visual. Small screen video, Anne predicts, is the next big thing. It’s easy to create, easy to share and easy to consume. Pauline Ores at IBM shares with the audience information about the deep Web or the majority of content on the web that is not crawled by the search engines. Next generation search will do more than the existing model and understand intent, reflect current events and support insight creation. Q: As an agency, how can we start approaching clients with solid information about social and where to start? Frank: Start with Twitter alerts to find out who is talking and what is being said about the niche. Show the client the conversation and see where they want to fit in. Is it for customer relationships, competitive intelligence, etc? Dixon: Use a URL shortening service that allows you to track metrics. See how many people clicked, etc. Parting words from Pauline, and an emerging theme of the conference, is that humans are social creatures. Provide them with a way to connect and they will. Provide them with a way to exchange information within communities, and place aside authoritarian sources of content, and they will gravitate toward peers. You are totally correct about using less and less of Google. When I am looking for a company I check out who is on what social network. If they are NOT on those networks then I go to Google. Sometimes I can’t find any information anywhere which is when I decide to walk away from the organization. I am avid user and would love to use it in my job. I understand how social networking works and maybe if someone who was less technical then me. They would use Google. I guess this depends on the amount of usage and what you are trying to accomplish. I think Google is in too many avenues to die off. Thanks for the comments Jamie. I agree that Google isn’t going anywhere anytime soon. However, there is an opportunity because people, like yourself, are turning to other sites to find information whether its Facebook, YouTube or Twitter. The next step for companies is to determine where their target audience is searching, reading and interacting. Thanks for the splendid post. I believe that Google usage is currently dwindling down due to the proliferation of better, more hi-tech avenues for online marketing and social media. However, I would just like to emphasize that Google is constantly evolving to cater to newer, more timely Internet needs. I wouldn’t be surprised if Google constructs another amazing breakthrough in a few days. What might happen is that Google figures out how to crawl and make meaning out of the content on social sites. This might help them to be THE destination again – think back a year or two to when Universal search launched. The goal was to eliminate the need to search news sites, video sites, image sites etc. – Social Networks and aggregators (feeds, profiles) are techniques to get social relevance and again there are multiple social context for each of us. keep in mind that Google is poviding one of the top RSS readers. This opens up some very interesting trains of thought. I think that there’s a lot of relevance in the references made to Facebook’s increasing audience and link building as well as their attendant advertising and search that will get bigger. It will be interesting to see how much impact the recent acquisition of Friendfeed will have on both Twitter and Google. Thanks for this post: it’s timely for me, as I’m working to understand more deeply where my clients’ clients are talking, and how to be authentic in those spaces in Japanese and in English. Also, because we publish content (podcasts and videos), it’s a great reminder of where the meta information needs to spread. Great post! The fact that we are searching in other places is absolutely true. I haven’t used Facebook so much for searching unless I’ve been searching for people but I have used Twitter in the past. I think the post asks a very important question, this is how you must always think in SEO. I just came across this post and it really resonated with me. In our work with small businesses we definitely see that discovery on the web is shifting towards social and real-time vs. traditional Google searches. This presents a particular challenge for small businesses. A few more comments and reactions here http://bit.ly/1M2ROB.